Cape Breton Tourism Spotlight: Amazing Entertainment Comes to LaPicasse with The Crossing Borders Concert -April 24th, Don't Miss This Incredible Combination of Young Talent!!! Amazing Entertainment Comes to LaPicasse with The Crossing Borders Concert -April 24th, Don't Miss This Incredible Combination of Young Talent!!! If you enjoy an evening of great entertainment, with lively music and step dancing, you will definitely want to take in the Crossing Borders Concert at LaPicasse in Petit de Grat on April 24th at 7pm. Admission will be $5.00 per person or $10.00 per family for advance ticket sale or at the door on the night of the concert $7.00 per person or $12.00 per family. For tickets call 902-226-0149. 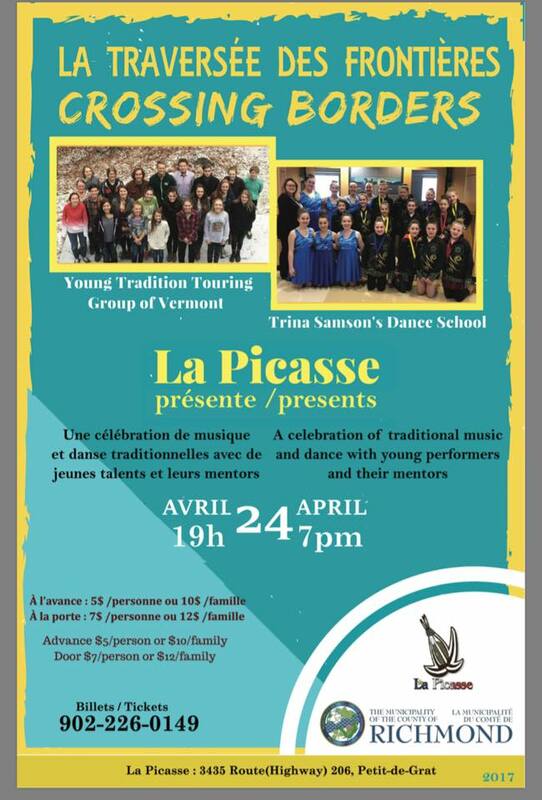 Centre La Picasse is proud to present the 25 dancers from the Trina Samson Dance School along with the 23 talent musicians from the Young Tradition Touring Group from Vermont and their mentors, coming together for one very special evening of traditional music and dance. Get your tickets early, as you will not want to miss this event. Joining the Samson Dance School will be the Young Tradition Touring Group from Vermont, made up of a very talented young group of entertainers from the US. We are very lucky that during their tour in Canada, we have been given the opportunity to showcase our neighbouring countries talented young performers, performing along side some of Cape Breton's best Traditional Step dancers, from the Samson Dance School. This will be the US groups only stop in Richmond. Special thanks to LaPicasse and the Municipality of Richmond for their support with the concert.